Oh man, it's time for more of that good-good. 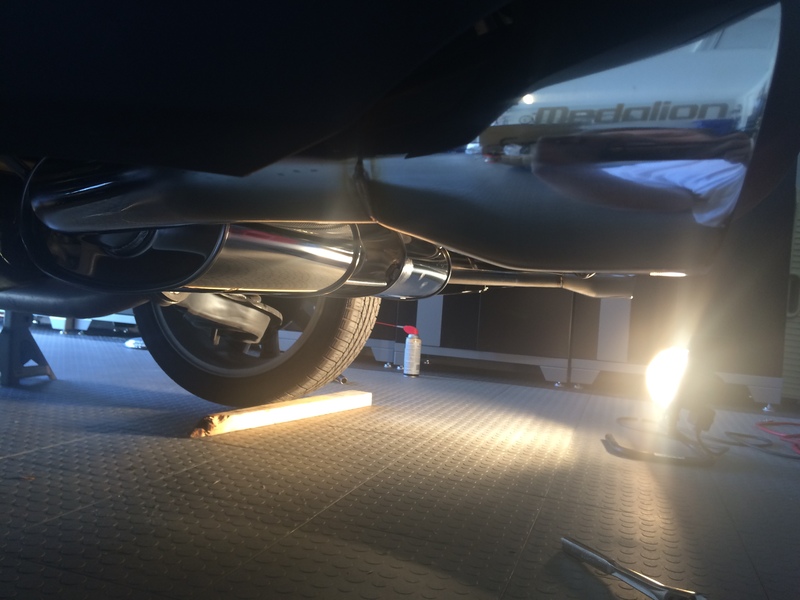 The Tanabe exhaust is a stainless steel axle-back (read:rear axle) exhaust. It's purely sound, with some freed up space. Everything. All of it. I love this thing. It's a beautiful polished metal, with stamped logo on the side. Phat four inch tips, with 2.5in piping. It bolts right up to the factory exhaust and hangers. It lined up centered and didn't stick out too far. It's great. It's a gorgeous, shiny piece of metal underneath the car. It sounds incredible too. On cold start, it has a room shaking growl until it calms down. When you step on it, it'll grumble and roar down the road [I]with no rasp[/]. Bingo. Right there. 2.5L I4, with an exhaust that gives no rasp. This is not a garbage overpriced fartcan exhaust. It's a mature, incredible sound that'll surprise people you pass by without being overbearing or too loud. It's great; it's so great. The price. At $660-700, it's steep, especially compared to competitors such as Corksport ($500), but it's not as expensive as the AutoExe ($900!!) piece. It's so easy. I mean it. Remove the two bolts, pop off the two hangers, then the other two, and reattach. It's so great, and very simple. Overall, I highly, highly recommend this exhaust over all others. Remember, we don't drive racecars, so one doesn't need a hi-flow cat and freeflowing exhaust. This piece sounds incredible, looks great, and is easy to install. I love it. Another great review. Love how this thing looks and im sure the sounds is great. The Tanabe Medallion series has always been about low growls and aggressive tones but not window shattering screaming. I don't think I have ever heard a Tanabe Medallion sound raspy. Question, what made you go with this over the Magnaflow which is a catback for about the same price. Also the OD of the Tanabe looks identical to the OD of the stock piping on the other side of the flange. I assume if the Tanabe is a 2.5" OD then its most likely a 2.25" ID. Is that the same as stock? Or is the stock piping even more restrictive? 2"? Stock piping is somewhere between 2.25 and 2.5, not sure. I went with this over Magnaflow due to not liking the sound of the Magnaflow exhaust. Plus, again, these aren't racecars, so I don't feel the need for a catback. To each their own. The sound of the Magnaflow, to me, was not what I was after. I liked the sound of the Tanabe all through the rev range, so I knew that's what I wanted. I spent good time listening to exhausts for these cars before deciding. Got it ^^ I am curious because I don't want to go with the magnaflow if it ruins the sound with that extra piping up to the cat. 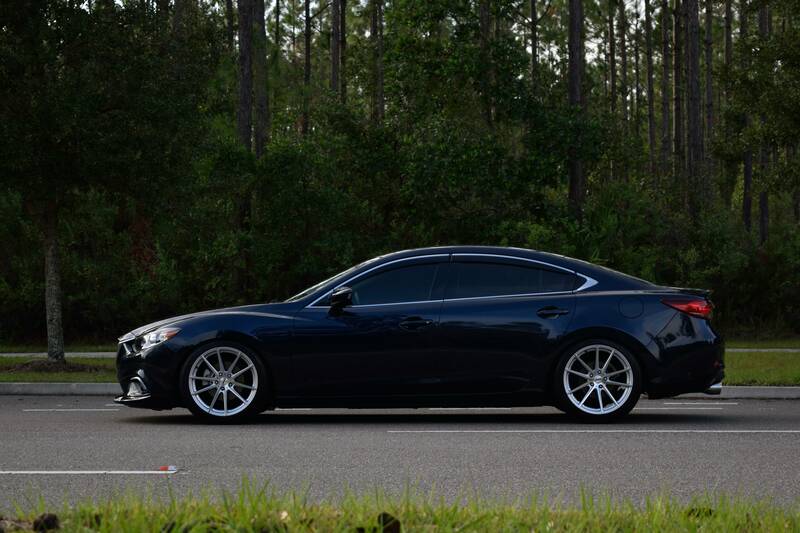 I agree preference of look and sound should matter as much as anything since full bolts for these cars will probably not net more than 5-10 whp. Might as well get what you want regardless of 1 whp gain or 2 lol. Exactly. These are not and never will be fast cars until forced induction is an option. At that point, you need a new exhaust anyways. Can't try to make a slow car fast here. Have had my Tanabe Medallion exhaust for 10,000+ miles now. Love it! Very mellow and a great sound. Got it for $550 shipped! Last edited by toy4x; 01-02-2017 at 07:53 PM. +1 to this exhaust being the perfect balance of looks/sound. I even noticed a nice bump in the low end pull after adding this. If I didn't purchase my racing beat axle back I would have gotten the Tanabe axle back. I chose the racing beat due to cost and since I live in Los Angeles I can pick it up straight from the factory showroom. I do prefer the look of the dual muffler of Tanabe, but in the end comparing videos they sound pretty similar to each other, with tanabe being a bit louder I think, its hard to tell in videos. 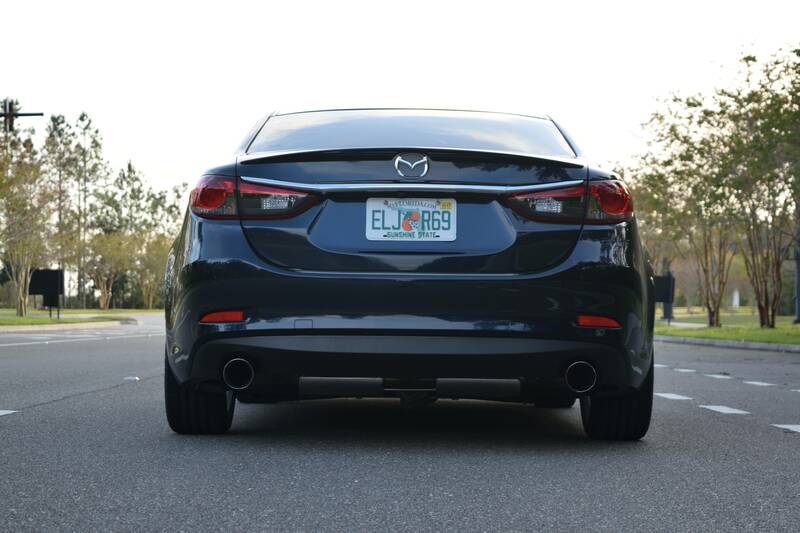 sorry to say this but yes, it looks like the Corksport or Tanabe have better looking exits on the tailpipe. BTW I did some research about ID/OD since I asked. Based on KamiSpeed's website, the Tanabe Medallion is listed as 60mm piping and 100mm tips. That translates to a 2.362" piping diameter. Based on how it's listed, I will assume 2.362" piping means OD. Tanabe lists themselves that they use a 1.24mm (18GA) thick T-304 stainless steel. This brings your ID to 58.76mm or 2.313". Stock is 2.25" (57.2mm) so that is a 1.56mm or .06" larger than stock. As we've said before this is not a racecar but I still think that slight difference could net you 2-3 whp increase. 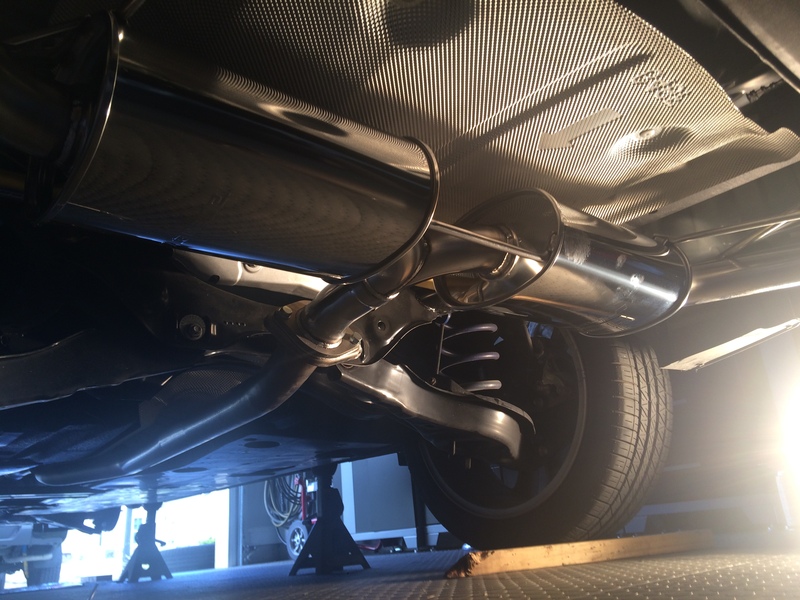 I am interested to compare muffler to muffler as I hear the stock mufflers are super restrictive. Also this exhaust should be considerably lighter than stock, further increasing the possibility for performance benefits. So many numbers here is a summary. Disclaimer: as seen above I am assuming the 60mm to be OD based on the wording... "60mm piping." Great exhaust system, but really hard to justify that price... If I we're getting catless headers I would seriously considering getting this axle-back though. Alone, i'm just not sure it's worth it. The freed up space underneath the car isn't necessarily a good thing. 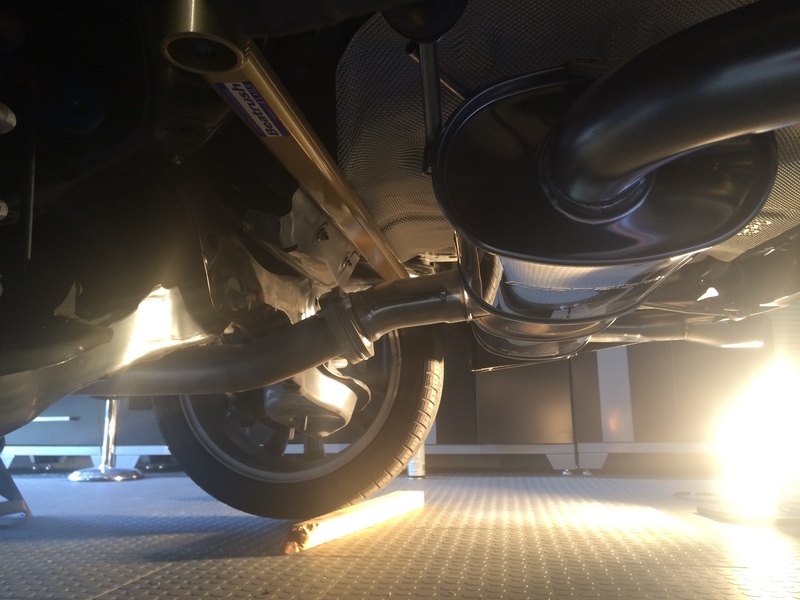 The stock muffler's big bubbly shape improves aerodynamics underneath the car.